Super comfortable. Breathable and a great weight. Very happy with this. Add luxurious comfort to your bed with the Grandeur Collection Cotton White Goose Down Comforter. 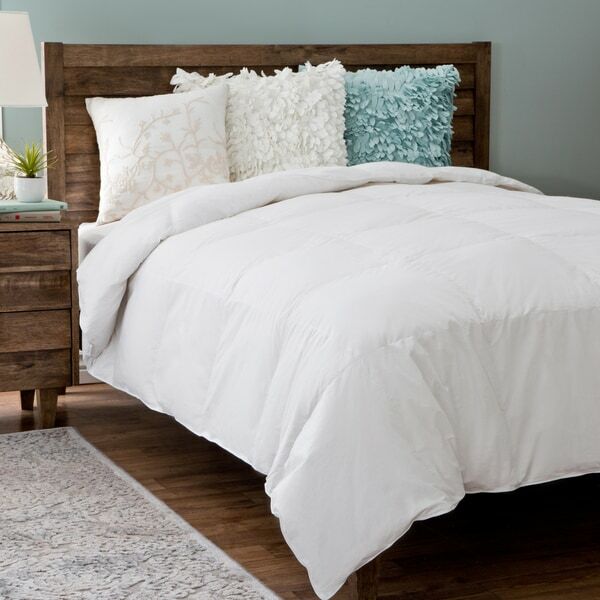 This comforter features a soft cotton construction with white goose down fill that offers medium warmth for use during all seasons. Ordered this to replace my very old down comforter. I am very pleased. Fits very well on my California king bed. I also like the medium weight which is way warm enough. Perfect weight , not heavy not light. good size l for calif king-it isn't skimpy at all. the cotton cover is good fabric. Great medium weight! Use all winter and well into Spring. Good value! For the money this is really a good deal. Happy with my purchase. The fit is perfect. "Are there ties or buttons to keep the duvet cover in place?" No, There are no button on the comforter.